Notification Center in iOS makes it easier than ever to see when new messages and mail comes in to your device, but if you receive sensitive or private emails on your iPhone or iPad, you may not want them showing up on the lock screen at all. If you’d rather not see any alert or notification showing up on the lock screen of your iPhone, iPad, or iPod touch, you can make a quick settings adjustment to hide the new mail notifications from showing on the locked screen of iOS devices completely. The settings may look slightly different depending on what version of iOS you are using, but the feature is the same and the ability to hide all the notifications from Mail showing up on the locked screen of a device is the same too. This will stop all aspects of new mail arrivals from showing up on the lock screen, including the email sender, subject, and body preview – there will be no email alerts on the lock screen at all. If you want to disable the notifications from appearing at the top of the screen as well as preventing them from showing up in Notification Center, you’ll need to select the “None” option in the three side-by-side options at the top of that same settings screen. Using this setting is a good option for added privacy, but it’s also handy if you’re just not interested in seeing notifications on your lock screen every time a new email comes in. Another great option that is a bit of a compromise, thereby allowing you to still receive email notifications but not showing the content of them, is to hide the email preview from showing on lock screen of iPhone or iPad, which instead will just have a simple sender and “mail message” note attached to it. Then it’s up to you to unlock the device and go to iOS Mail to read the email. You can also disable the new mail alert sound effect in iOS too if that bothers you. For those who had this lock screen preview of Mail disabled to begin with, you can obviously reverse this process to turn the lockscreen email previews on, but be aware that anyone who picks up the iOS device can then see the basic sender and subjects of the newest email messages, even without entering a pass code. Awesome tip. Works on my iPad too, but you already pointed that out. Thanks! 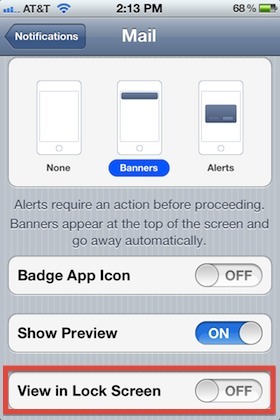 Almost a better tip in that screen cap is disabling the mail badge icons, which you can also do with other apps too. Great if you have enterprise email hooked up and are annoyed with all the ding-a-lingy red buttons! I wish you could chose which email accounts showed up on the notifications, as I don’t want my junk mail account buzzing my phone all the time.